Home / Products / Haydn, Franz Joseph (arr. Paige Dashner Long) – Toy Symphony for Flute Choir. Adapted from Leopold Mozart’s Cassation in G for Toys. This fun, new arrangement from Fall’s House Press was adapted from Leopold Mozart’s Cassation in G for Toys and dedicated to the 2013 New England Conservatory Summer Metropolitan Flute Festival Orchestra. 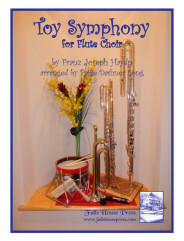 This arrangement is for mixed flute ensemble and contains parts for various “toy” instruments.